‘I feel so relaxed’ is the usual dreamy response after final relaxation at the end of a yoga session. ‘I feel SO relaxed’, with an even more bemused expression, is the usual response after yoga nidra! As a yoga teacher and nidra facilitator I am used to witnessing students’ novel experience of ‘proper’* relaxation, savasana, parking the body on the mat. And lovely it is to see. I’m also delighted to observe, as a long time practitioner, that I have toned my relaxation response, and, looking at colleagues, I see how yoga practice keeps you youthful, shiny and healthier. Biomedical knowledge is catching up with what yogis have been evidencing for centuries. The relaxation response (RR), especially when practiced over years, actually reduces the causes of aging and disease. The deep rest brought about by yoga exercise, conscious breathing (pranayama), meditation and yoga nidra, among other practices, tones the RR. Researchers describe the RR as ‘the physiological and psychological state opposite to the stress or fight-or-flight response’. The autonomic nervous system, over which we supposedly have no control, has two parts: fight-or-flight and the RR. Fight-or-flight produces cortisol and other hormones that help us run away from a tiger or thump an aggressor; not actions we are called to do very often. Fact is, constant stress hormones in the blood stream result in inflammation, which in turn causes disease. With RR techniques, it’s not a question of suppressing fear, anxiety and stress. It’s about developing the peaceful response so it is the default reaction to unnecessarily fear-based challenges, and so choosing this over our survival programming. In diverse trials the RR has been shown to alleviate the symptoms of anxiety as well as reducing heart beat, blood pressure and diabetes, for instance**. Optional ‘science bit’. Epigenetics, which shows you can change the expression of your genes, has grown into a legitimate field of research in the last 15 years or so. The Darwinian legacy came to mean that you were your genes. Your environment might trigger some genes while others remained unexpressed, but basically your fate was in your genes. Gene theorists even named this belief ‘The Central Dogma’. Now cell biologists have shown that mind over matter can change how your body works. Bruce Lipton** overturned the idea that the nucleus is the cell’s ‘brain’, deciding what the RNA transcribes from the DNA stored there. Lipton has shown that in fact the cell ‘mem-brain‘ (he loves this pun) is in charge, responding to the body environment and, by extension, the outer environment, to allow in the signals to produce responses. Long story short, with an RR toned by practice, that is to say, a more peaceful response, otherwise stressed inflammatory responses are less likely. A ‘ground-breaking’ 2013 study*** showed that in people using RR techniques there were immediate changes in the expression of genes involved in immune function, energy metabolism, insulin secretion and telomere maintenance (telomere shortening means aging, put very simply). The study had both long-experienced practitioners and novices with 8 weeks’ training. Both did well, but the longer experienced’ results had ‘more significance’, in other words a more pronounced effect through the training of longer practice. Relax your mind and body to go beyond them. A toned relaxation response and a healthy, less disease-prone body are wonderful attributes. For yogis, however, these are merely beneficial side-effects of practice. The point is to be in a position to transcend even that calm mind and healthy body. With the mind and body at ease it is more possible to experience one-ness, understand the True Self and be able to live more in God’s likeness on this mortal plane. Glimpses emerge of this experience and understanding, perception changes, you evolve. What to do. 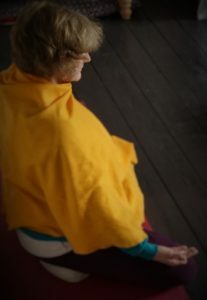 It all begins with some tensing and stretching of muscles on a yoga mat, a letting go, conscious breathing , being guided in nidra, and a gentle focusing of the mind on higher qualities on the meditation cushion. Chanting, prayer, contemplation and other practices work too. When people come to yoga and experience true rest such as they have rarely felt before there can be a grief in thinking, ‘if only I had started this earlier’. Not only can you experience rest like there and then, but the truth is, you really can also change your mental health, physical pathology and reverse habits of a lifetime. Do not delay: come to yoga and begin this lovely experiment to change your body and mind for a more peaceful life within and without. * Swami Vishnu-devananada described a very practical five-point programme, The Five Points of Yoga, including proper exercise, diet, breathing, relaxation, and positive thinking and meditation. See this blog.